New Entry Sustainable Farming Project, an initiative of Tufts University’s Friedman School of Nutrition Science and Policy and additional partners, works locally, regionally, and across the country to strengthen local food systems by supporting new farmers. They serve and collaborate with the people, communities, and organizations in Massachusetts, the Northeast, and beyond. New Entry provides a living laboratory to apply classroom knowledge and develop applicable skills for students and others interested in learning. New Entry interns have done research, developed educational guides and training curriculum, assisted in delivering curriculum for our Farm Business Planning Course, created marketing materials for World PEAS Food Hub, provided technical assistance, and identified land for potential farms in our Farmland Match program. 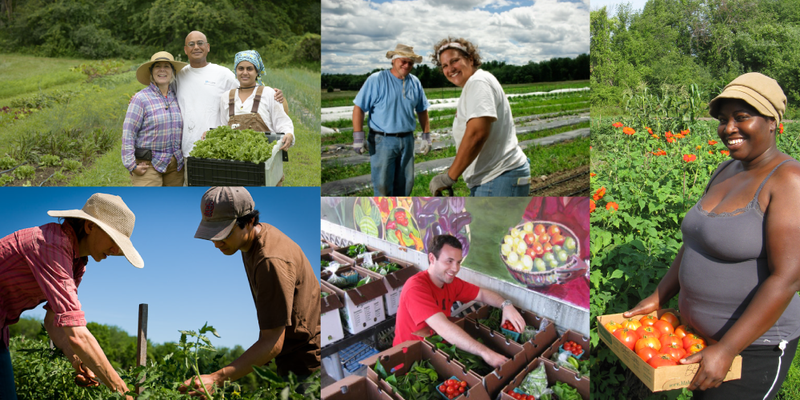 Interns work at the Tufts University offices, at the Lowell office training facility, at the farmers market, at the CSA distribution point, or in the field. For New Entry, the outcomes of these student internships can be significant. "I began to understand the beneficial role of a cooperative CSA in a farmer's life, as well as its role in the greater Boston community. New Entry's CSA model provides an incredible amount of support for those who are new to the U.S. and new to farming, while also reaching many people who might not otherwise have access to or be able to afford a CSA share. I enjoyed getting to know a few farmers who were all very appreciative of what New Entry had to offer," says Hannah Sobel, MS FPAN/MA UEP '15. Hannah assisted in researching and contacting potential CSA Food Hub partners and pick-up sites, wrote farmer profiles for the CSA newsletter, conducted CSA price research, and did data entry for yearly farmer surveys.